From left to right are Gallia Commissioner Harold Montgomery, Gallia Sheriff Matt Champlin, Gallia Commissioner Brent Saunders and Gallia Commissioner David Smith. Commissioners recently confirmed that a little over 50 percent of this year’s general fund would be going to criminal justice issues. 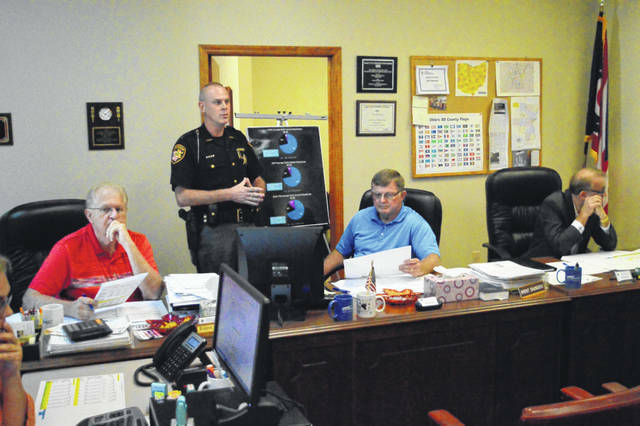 GALLIPOLIS — Gallia Commissioners are in discussions with the Gallia Sheriff’s Office and seeking solutions on how to combat rising corrections costs and one of the solutions being considered is potentially raising the county sales tax. According to a resolution passed by commissioners, public hearings are tentatively slated for January 3 and 10 in the coming year to allow citizens to voice their opinion on the potential increase in sales tax. Both are set for 11 a.m., during standard commissioner meetings, which are traditionally scheduled on Thursdays in the Gallia Courthouse. The Gallia Jail is reportedly a 22-bed facility and over 70 years old and housing more inmates due to growing prisoner populations and the opioid epidemic. Smith said it was not unusual to have “over 40 plus” inmates in the jail in recent times. “It was built and designed for that time and does not meet the needs of our law enforcement required for today,” said Smith. “Gallia County is kind of unique and fortunate in some ways because we have a quarter percent permissive sales tax that’s still remaining (to be utilized), by the Ohio statute, which can be placed on by a vote of the three county commissioners,” said Smith. County governments across Ohio can utilize up to one and a half percent in sales tax for local government funding. Around a quarter of a percent remains for Gallia to levy. Funding would go directly to the general fund, Smith said, and is intended to assist law enforcement costs and potentially be used to construct a new jail. County officials estimate the sales tax could raise between $600,000 to $800,000 in a year. The county lost around $600,000 in annual funding alone by no longer being able to access MCO sales tax funding due to state decisions. The Gallia County General Fund has roughly $8.6 million for the coming year to fund county departments. “Our current sales tax in Gallia (including the Ohio state sales tax of 5.75 percent) is seven,” said Smith. County government currently uses its access to a one and a quarter percent sales tax. The addition of a quarter percent would cap the county’s sales tax access at one and a half percent and, with the addition of Ohio’s statewide 5.75 percent sales tax, it would make for a total of 7.25 percent in sales tax to be paid across the county by visitors and residents, if the commissioners’ proposal passes.